The Kubernetes Provider V2 enables a wide variety of ways to deploy your manifests into Kubernetes clusters. This page provides best-practices for doing so. If your registry exposes image changes by digest, we recommend deploying images by their digest rather than tag, e.g. gcr.io/[email protected]:95ff090... rather than gcr.io/my-image:v1. The digest is a content-addressable way to reference your image, because it’s derived from the hash of the image contents. If your manifest points to an image by its digest, you know that each time it’s deployed it points to the same contents (binary, dependencies, config, etc…). If you rely on the tag, deploying the same Manifest twice can have different results. Templatize your manifests outside of Spinnaker to point to the digest you want to deploy. This means using some templating language (jsonnet, jinja) to express & render your manifests before sending them to Spinnaker to deploy. Rely on Spinnaker’s artifact substitution and a trigger that supplies your image by digest. To keep track of what’s changing in your cluster, and under what circumstances it is changing, we highly recommend configuring Spinnaker to emit events to an external audit log. Spinnaker already generates events for any events running through its orchestration engine, all that’s needed is an endpoint to send them to. When set up, any pipeline that deploys or updates a manifest will have your fully hydrated manifest recorded. Anytime Spinnaker deploys a ConfigMap or Secret, it appends a version to its name. If that exact ConfigMap or secret is already running in the cluster, it’s not’ redeployed. Downstream stages that reference the ConfigMap or secret will deploy the version chosen by Spinnaker. Unless your application requires hot-reloading of configuration, this is essential for practicing safe delivery. Say you are rolling out a new feature, hidden behind a feature-flag. All that’s needed is an update to a ConfigMap referenced by a Deployment. If your Deployment has mounted this ConfigMap, pushing a change to it immediately allows all Pods to read the update, rendering any sort of rollout useless. This happens even if the Deployment rolls out another configuration change using the typical Rolling Update policy. If instead you push a new ConfigMap, and edit the Deployment to reflect this change, only the newly deployed Pods will have your feature flag enabled. Every Pod reading that ConfigMap is rolled forward to the old configuration at once, even ones belonging to controllers that aren’t necessarily broken. If the broken controller was rolled out with a dependent binary change, rolling forward the config at the same time can exacerbate the problem in the current broken controller until the rollout completes. 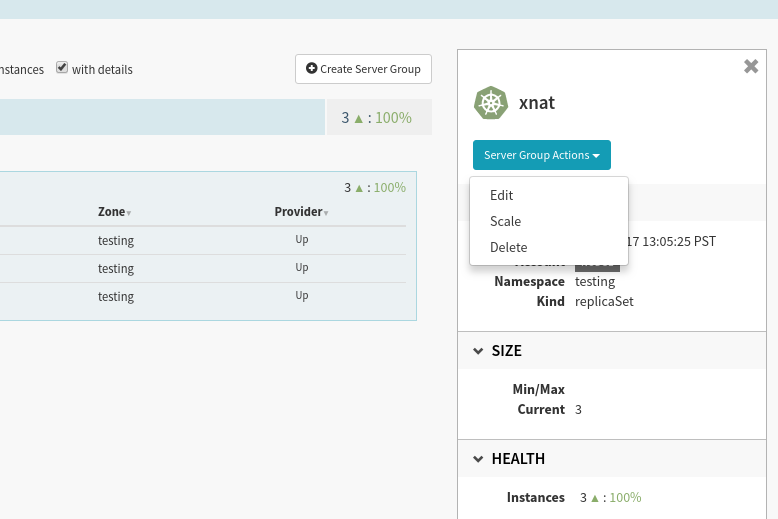 Spinnaker provides quick ways to edit your deployed Manifests in the infrastructure screen. This is done to provide you a quick fallback when mitigating a broken rollout, or to increase the number of pods serving traffic. However, as long as your manifests are stored either in an external store, or in Spinnaker pipelines, these edits are overwritten the next time you deploy your manifests. For this reason, any edits that can be made in your stored manifests should be made there and redeployed.